Curiosities can turn into a never-ending trail of wanting to know .. and the more one reads with the help of the internet the more confusing things can become. 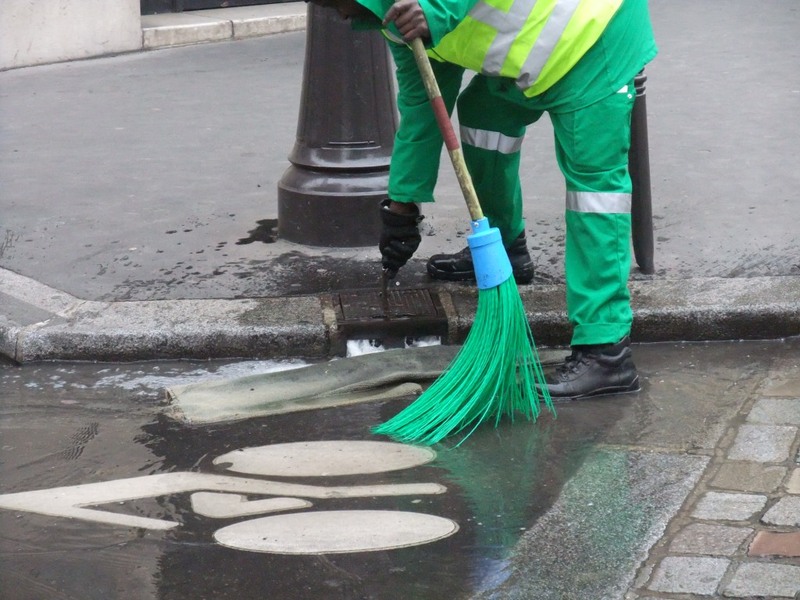 One of the reasons it’s taken us some time to put the following together .. our top 10 (there are more of course) Curiosities of Paris ..
We love to see these green clad men walking with their matching bright green plastic brooms. When first spotted, we were worried about the amount of water that seemed to pour down the gutters and into the drains, and discovered that this rather frightening ‘waste’ was usually accompanied by one of our green men. 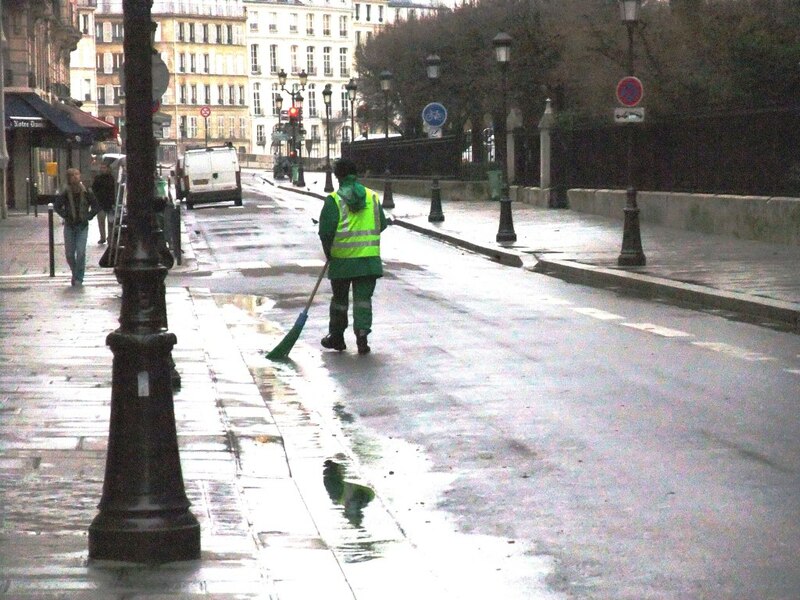 Our street cleaner, beside Notre Dame, follows along the gutter sweeping all along. We then discovered that Paris is one of the very few cities in the world, and we think the only one in Europe, with a dual water system: potable, ie, drinking water and a completely separate non-potable water system. So there is not the waste of drinking water that we were worried about. This system of non-potable water is used for street cleaning, watering the many public parks and gardens, supplying fountains and fire hydrants .. and more. The wonderful skill of our street cleaners, special broom. piece of carpet to direct the flow and special key to release the water. Almost always it seems the roads and pavements are so well designed the water simply flows down beneath the curb, around the corner and on to the targeted drain. The cleaners use a special ‘key’ to release the water and we often see them use a piece of old rolled up carpet to force the water to one direction of the gutter or the other. It does make you stop and think about the planning and the maintenance that means any roadwork ensures the water flow is not interfered with. It was Georges Eugene Haussmann, more than 150 years ago, who had the foresight for these two systems. He realised how important it was to have clean water, intelligent sewerage systems, wide open boulevards to let light and air flow and to provide masses of small and large parks with lakes and fountains. Thanks to Stewart I now have the book ‘The man who made Paris’, the biography of this man – an excellent book about a brilliant man. 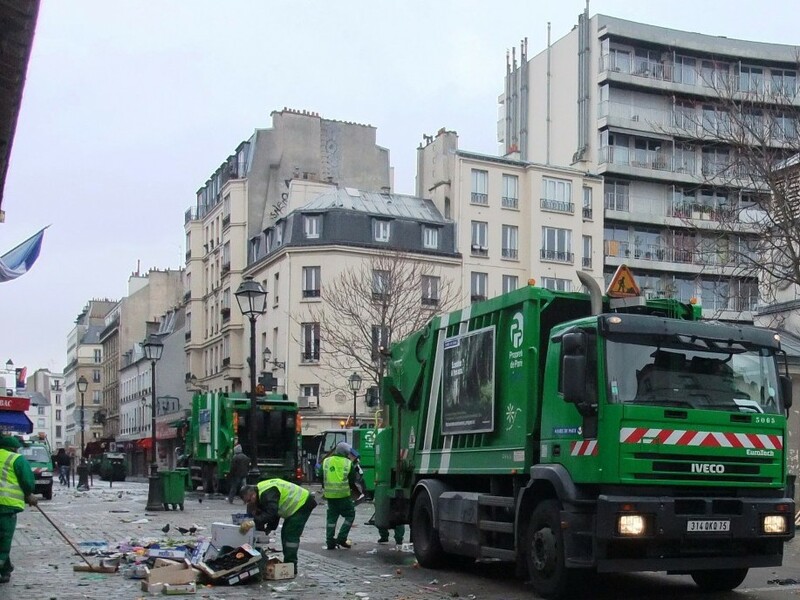 Serious clean-up team, every day after the markets at Place d'Aligre. And of course, with the masses of excellent markets around town there is the industrial strength cleaning force out and about every day cleaning up the huge mounds of debris once the stalls are gone. 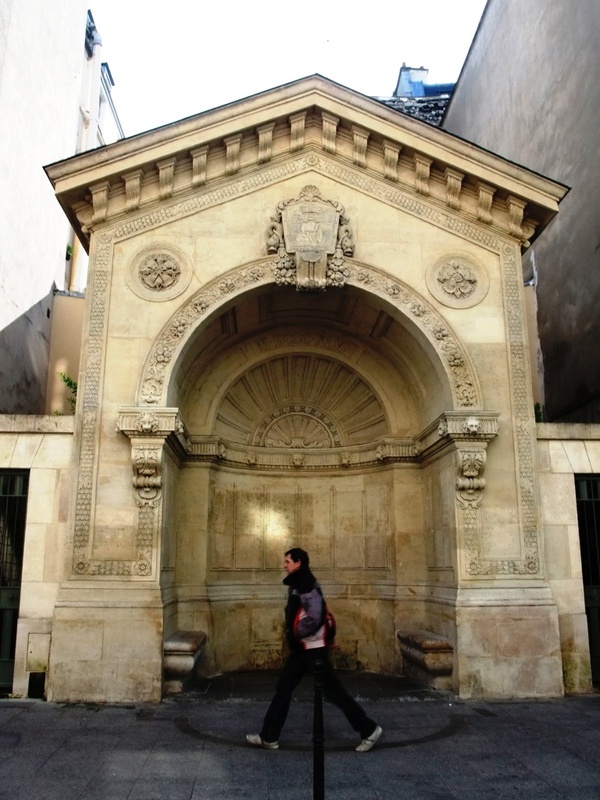 Embedded in the wall surrounded by buildings is this hidden fountain in Rue Turenne, Marais. like the one in Rue Turenne in the Marais quarter which seemed to beckon with the sound of the water falling as we walked by. This one is set back off the street into the buildings around it. There are the stone-built variety (like this one), those we have seen date from the 18th Century. And the iron ones (see below) which were funded by a British born Francophile in the 1870s. 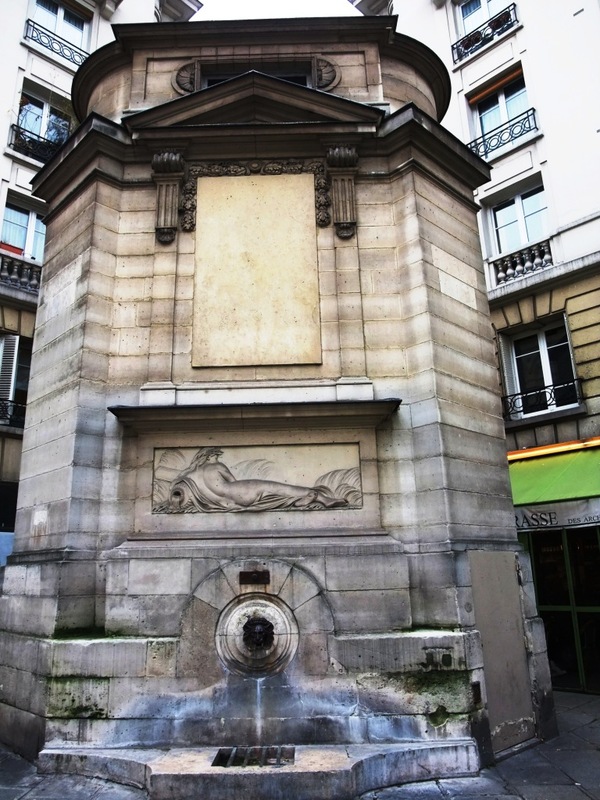 Another beautiful water fountain, this one at Rue Roquette near the Bastille. 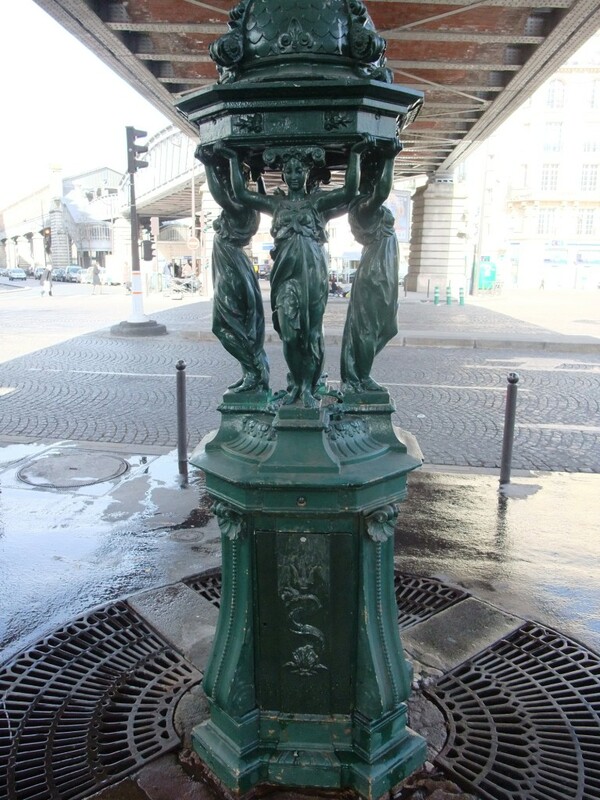 Free-standing water fountain - 19th century. 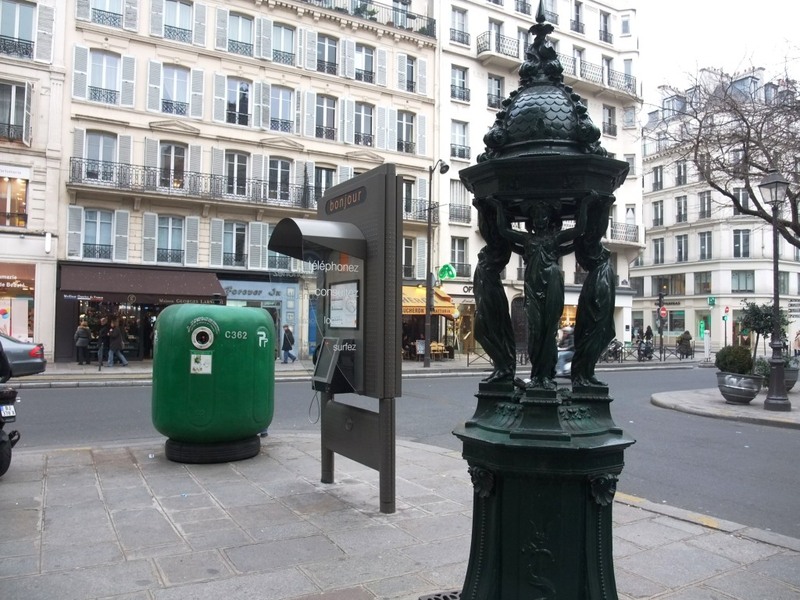 and another site focusing on water fountains of Paris: http://www.pariswater.com/fontaines/. The Wallace drinking water fountains also stand out although they are closer to what we see in Australia, a central, free-standing stem from which one can stoop and drink fresh water. 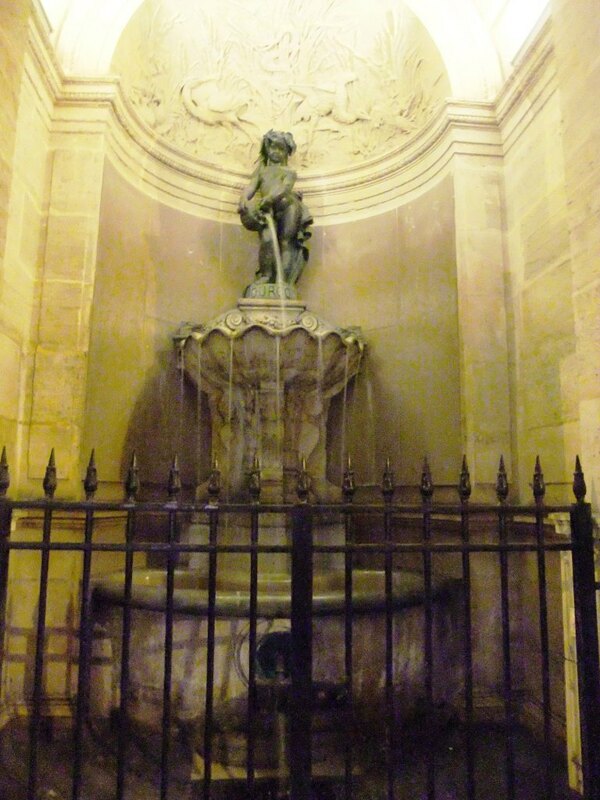 It’s the design of the Wallace drinking fountains and the fact they are still here that fascinates us. We wondered what they were at first .. beautifully constructed of iron, very ornate and we now know they supply potable water. There are more than 100 of them around Paris. Lovely old Wallace fountain, but ugly new telephone booth and even uglier bottle recycle bin. 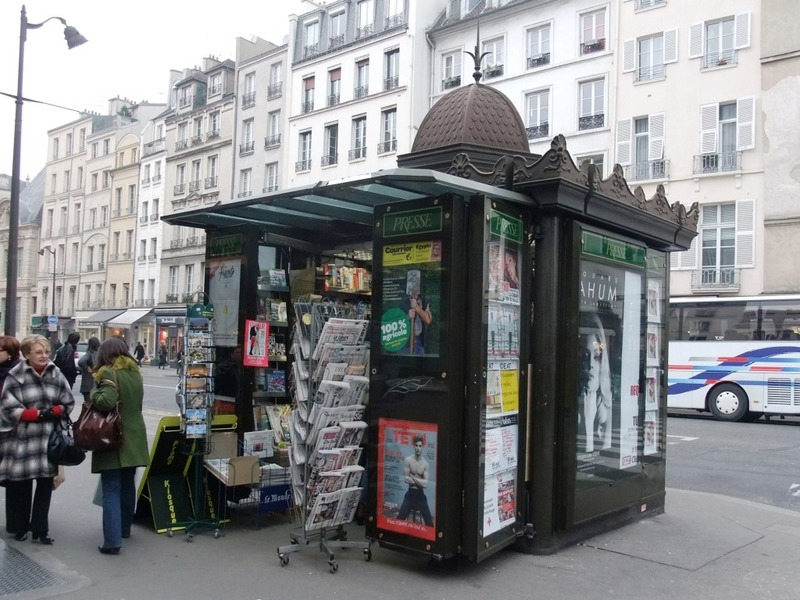 The more traditional style of newstand. They are in similar ilk to the advertising pillars, Metro station entrances and the prolific little newspaper kiosks in many of the quarters.. although we now see the ‘modern’ ones muscling in. 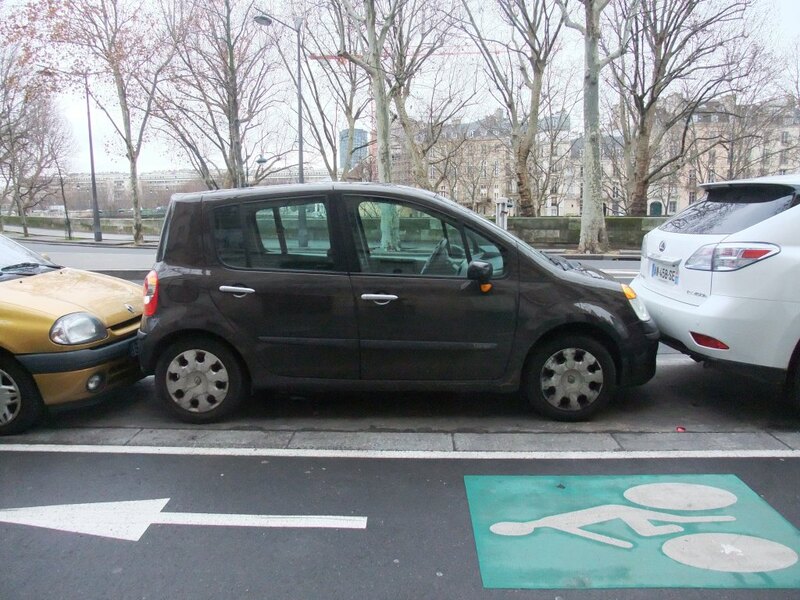 Over our winter stay as we walked around Paris we couldn’t help but laugh at the parking practices! Often cars are literally touching the bumper at both ends. Most number plates are bent in the front and many have scratches and marks all over them, particularly at the rear. A quite common site, bumper to bumper parking. We’ve seen cars bumping the one in front and then cracking the number plate of the one behind (and in one BMW’s case setting off the alarm). Another big van was shunting (and moving) the van in front whilst banging the car behind to get into a small space. All in a normal day’s parking! Unfortunately we also see great disrespect for parking across accessible ramps onto and off pavements and quite often we have to go out into the dangerous traffic to get around parked cars. They’re happy to park all along the pavement in sections (particularly in smaller towns) and even on corners where the pedestrian has to therefore walk in the road. It seems the parking officers allow these practices, or turn a blind eye. A very special thing in Paris is to see the small wall plaques in memory of those killed and murdered during the wars and earlier revolutions. 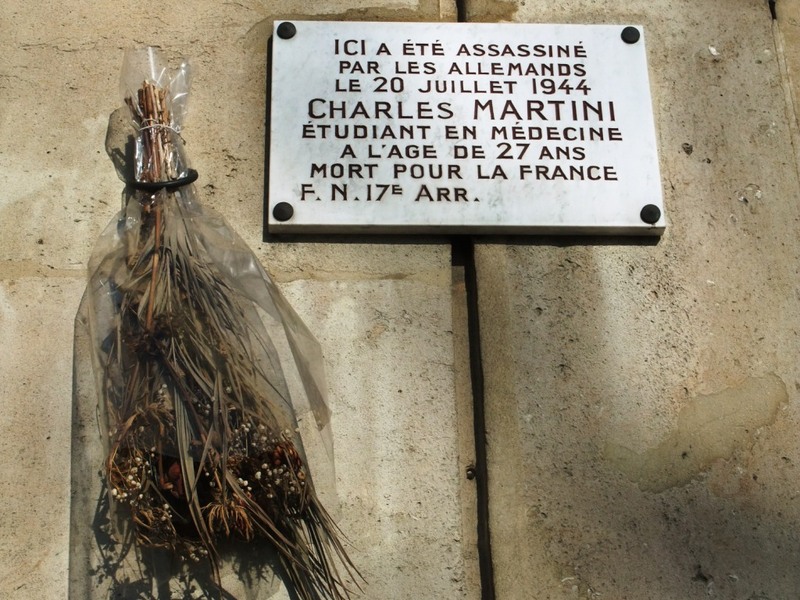 The plaques are placed on the specific building where the tragedy occurred and are often accompanied with a fresh bouquet of flowers from the Mairie (the Mayor’s office of the particular quarter). It’s a powerful reminder of the atrocities of the World Wars but in particular WWII. Memorial plaque to Charles Martini, 1944. 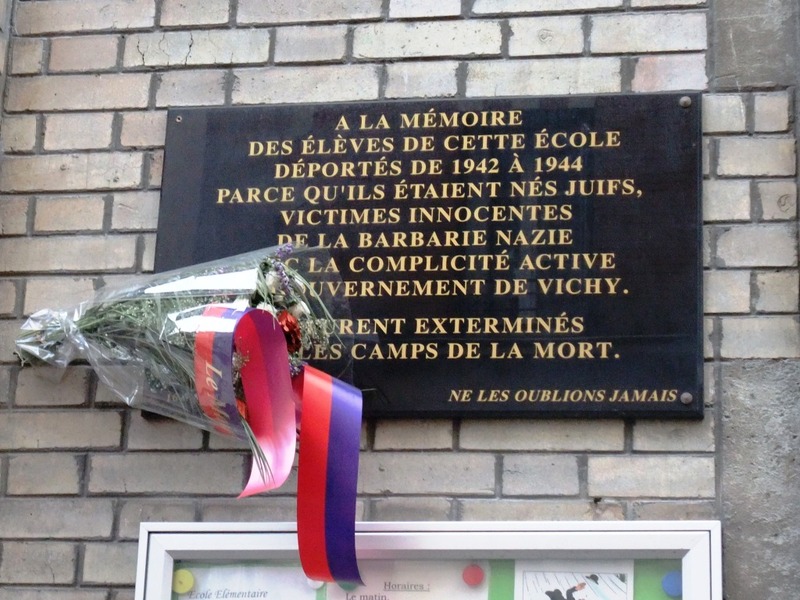 Memorial plaque at Boys School, Marais, 1942 - 1944. Memorial plaque to Jacques de Flesselles, 1789. This relates to before the French Revolution, when the municipality of Paris was headed by the provost of the merchants (prévôt des marchands). 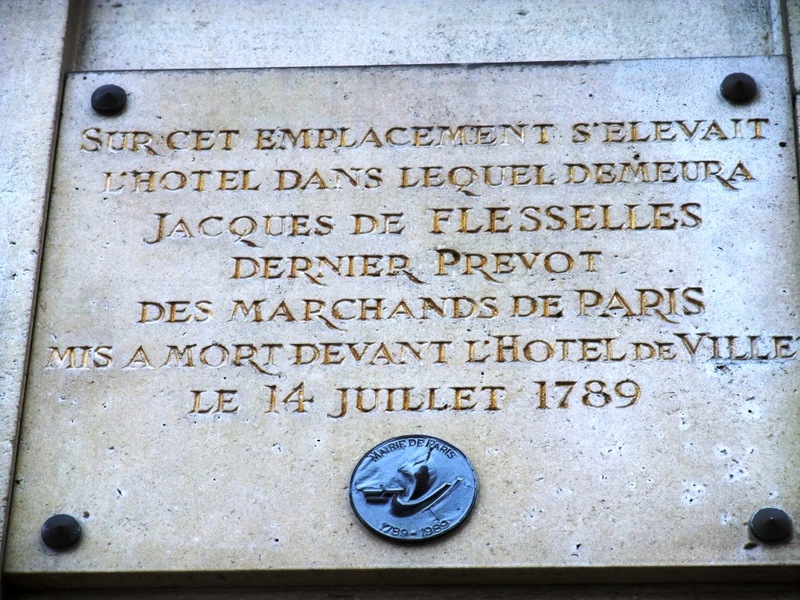 On 14 July 1789, at the end of the afternoon, following the storming of the Bastille, the provost of the merchants of Paris, Jacques de Flesselles, was shot by the crowd on the steps of Paris city hall. The next day, the first mayor of Paris (French: maire de Paris) was elected. Here is some more information on Jacques de Flesselles. There is some debate about the origins of the word baguette which literally means “little rod”, and is derived from Latin baculum — stick or staff. A popular myth is that baguettes were invented during Napoleon’s Russian campaign when he ordered a new shape of bread to fit down his soldiers’ trouser legs! Nice story but not true. They were invented by Viennese bakers in the 19th century, using a new steam-injected oven. The baguette became dominant when a French law in the 1920s banned bakers from working before 4.00 am. The traditional “boule” (shaped of course like the boule in the game of petanque) took a long time to prepare but the baguette, being long and thin, would be ready by breakfast. Believe it or not, the humble baguette was headed for extinction not long ago. In the 1960s, boulangeries (bakers) scrapped old-style methods in favour of industrialised baking, and the bread lost its flavour. Apparently it’s now against the law for a boulangerie to make bread by machine (it must be mixed and baked on-site) – although we can’t confirm this is true – and good loaves are once again on the rise (no pun intended) which is definitely true. 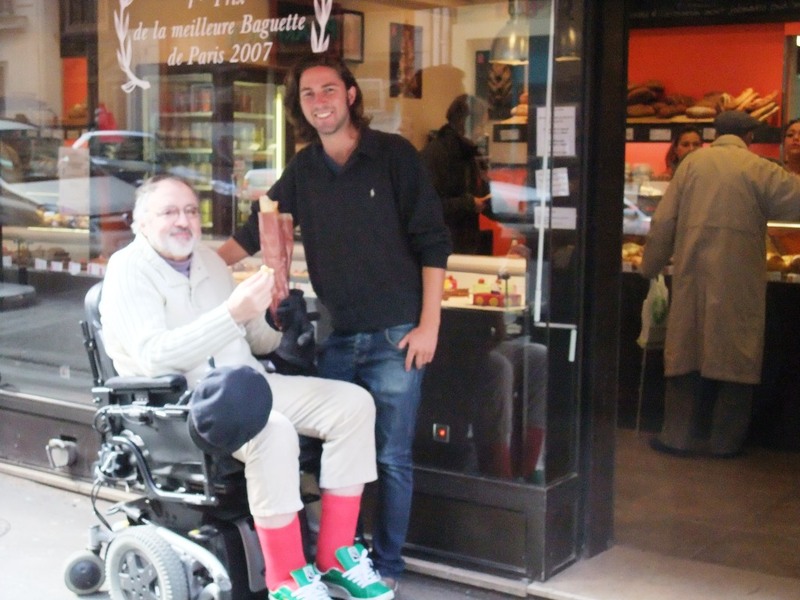 In Paris, there’s even a Grand Prix de la Baguette to name the best of the year and we visited one of the winners recently at Montmartre .. irresistible food. Stewart and Jack with baguette, more than baking hot. What we love is to see the way everyone carries their baguette, it’s special. No other purchase is so clearly on display and allowed to have such privileged contact with human hands. We also love seeing how many people can’t resist taking the loveliest piece and eating it as they walk along smelling the warm bread around them .. that is the very pointy end which is usually not seen, in its place is a jagged edge of white! I have tried to resist the temptation of pulling that end off before getting ‘home’ but I also struggle with it. A nice short note on this subject .. we learned that if you have your coffee standing at the bar in a cafe, as we often see Parisians doing, you pay half the normal price. It’s often only €1 for your quick fix of caffeine. The coffee bar and lovely tiled floor, gathering empty sugar paper packets. Observing this tradition of zooming into a cafe, asking for your ‘cafe s’il vous plaît’, I often hear added, ‘pressé’ which means in a hurry. 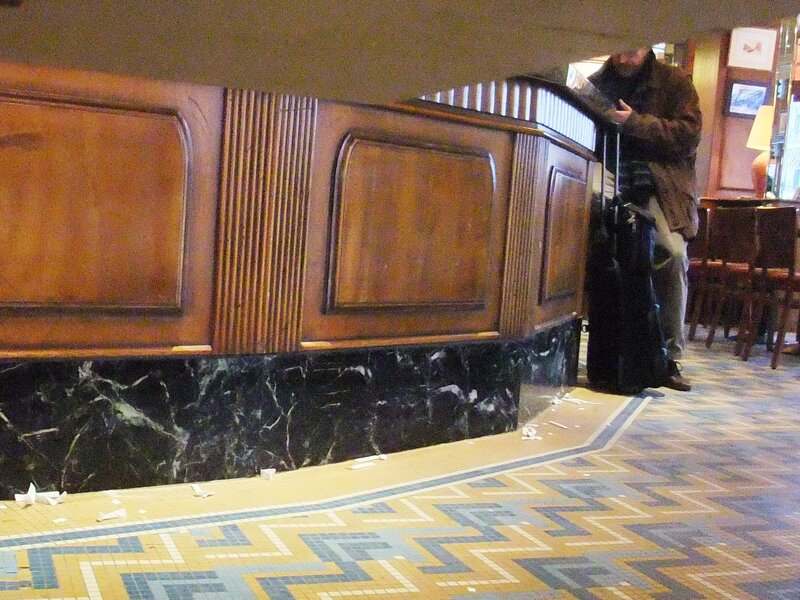 Perhaps this is their excuse for why there is often a carpet of sugar papers on the floor by the bar, ie, the coffee drinkers are in a hurry and have no time to put their empty papers neatly in the bin! 7. National Police .. Republican Guard .. Gendarmerie .. The many different Law Enforcement bodies can be very confusing: the Prefecture de Police, Nationale Police, Gendarmerie, Republican Guard .. we see all these emblems around the city, and a few others. For example Security of the Mairie who we would often see squashed into a little white car parked beside our boat. Police Nationale, formerly called the Sûreté, a civilian force; it has primary responsibility for major cities and large urban areas; run under the Ministry of the Interior). Gendarmerie Nationale, a gendarmerie; it has primary responsibility for smaller towns and rural areas, as well as all military installations; run by the Ministry of Defence but under operational control, for most purposes, of the Ministry of the Interior). Direction générale des douanes et droits indirects, a civilian customs service more commonly known as the Douane, under the Minister of Budget, Public Accounting and Civil Servants. 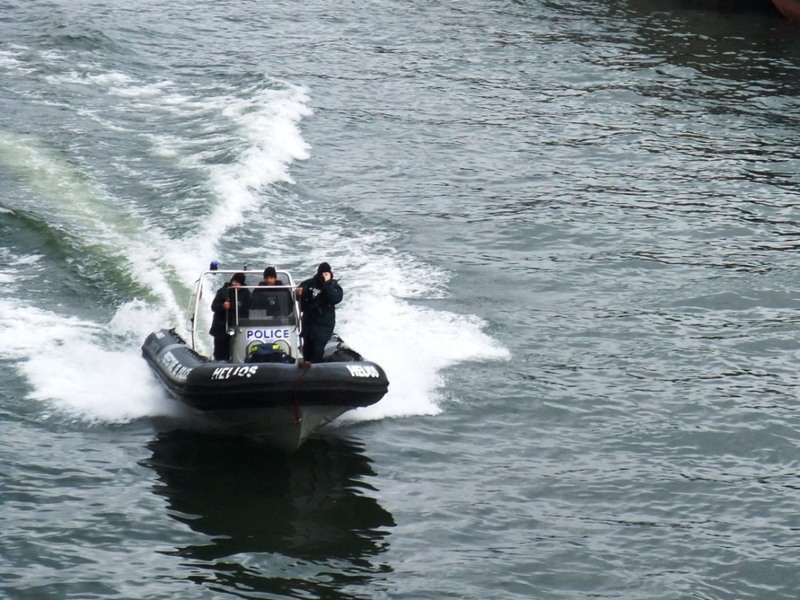 Water police, just outside our lock (occasionally their 'beat' is in our marina) on the River Seine. 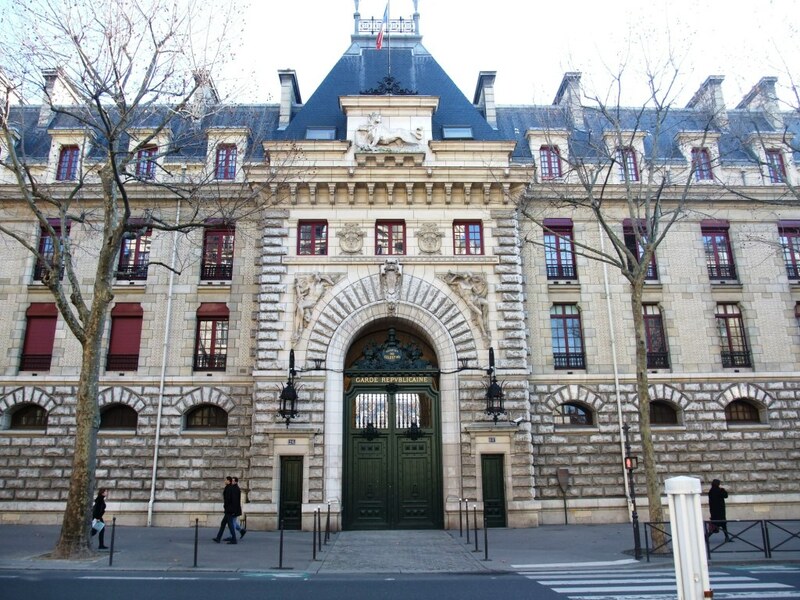 The Port de l’Arsenal is overlooked on one side by a six story block of offices which houses one of the large number of ‘Prefecture de Police’ stations (there is one for each of the 20 arrondissements (areas) plus 80 more support offices). 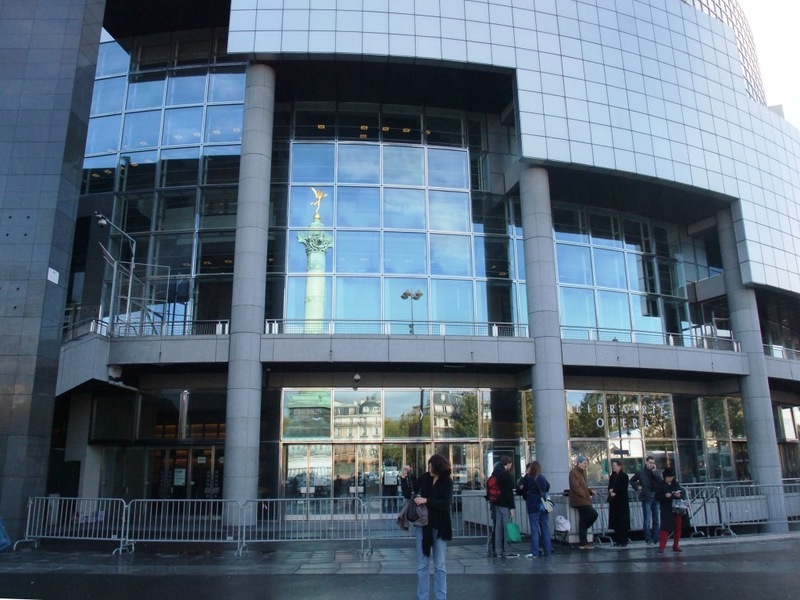 The ‘head office’ of the Prefecture de Police in Paris is on the Ile de la Cite which we visited lots of times to obtain Stewart’s visa for long stay (Titre de Sejour). This organisation is part of the National Police. We often hear the sirens roaring around us frequently with a frantic whistle (like a referee’s) demanding attention. It seems that many of the police cars are accompanied (or headed) by motor bikes and on these are the whistle blowers who make sure traffic gives them right of way. 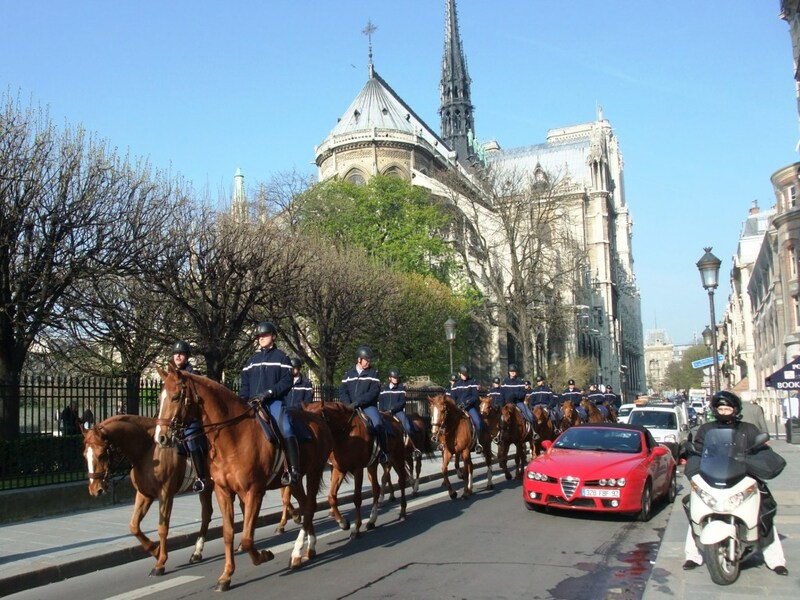 Mounted Gendarme, note their horses are all a matching colour. The foot police usually travel in threes. We’ve seen horse-mounted, motor-bike and scooter mounted, bicycle mounted, boat boarded and even roller bladed police. At our local station there honestly is the Roller Corp! We’ve seen them taking their blades off .. I was too embarrassed to take a photo! The Roller Corp accompany the massive inline skating groups that are famous as the largest in the world (they say over 10,000 participated once). Just around the corner of our local Prefecture of Police is the Republican Guard which is a force of French Gendarmerie “performing missions of honour and security for the benefit of the highest authorities of France “. Many of these are horse mounted and provide a certain amount of pomp at the big official ceremonies. The grand building at the Arsenal, Garde Republicaine with mounted police barracks. One smells the building. Now is that all clear? If so, please explain it to us in simple language. The point is there are heaps of them around, they are an interesting mob and they somehow seem to integrate rather than conflict with each other. Although the mob who randomly stop cars as they fly around the huge roundabout at the Bastille, right by our bus stop, can be very annoying as it mean the buses can’t pull in to the pavement to put out the ramp for us as the police cars are parked there. This is rather inconsiderate, and we note they are quite aggressive in their behaviour to innocent drivers. We had many lovely neighbours at the Port de l’Arsenal, one being Laurent and his gorgeous dog Woopie, who live on their boat called Phantom. Laurent works at the Opera Bastille on the technical side. When we first arrived in Paris, last October, Laurent offered to get us tickets for the opera and one day he arrived with the promised tickets for Francesca da Rimini, an Italian opera (as reported in our earlier blog). Bastille Opera entrance, no-one we know. We were advised by Laurent to make sure we arrived early, he suggested 7.00pm (it was to commence at 7.30pm) and we arrived at around 6.40pm. The huge entrance foyers seemed quite deserted and we didn’t know which way to go until we asked one of the ushers who pointed us to the lift and suggested door D. Here we found everyone packed into the section at the top back of the opera, there was standing room only. I pushed my through (more or less having to use my elbows) to ask the usher if there was anywhere for wheelchairs. We were sort-of redirected to door E.. where we found exactly the same scenario .. stacks of people and standing room only. We could see lots of empty seats further down and assumed as we had free tickets these weren’t for us .. and as we were discussing this a neighbour told us in English how this system worked. Most of the people standing and sitting in this section had obtained free tickets. Five minutes before the curtain raises they can then swoop down the steps and take the empty seats. Sure enough, at 7.25pm there was a lot elbow battling and our area in the ‘Gods’ emptied (more or less) and so we could sit side-by-side and watch the amazing opera. So now we know another important fact of life in Paris, many things are free but occasionally you have to fight for it! Quite an institution these days although our dear French neighbour (at the Port de l’Arsenal) was very vocal in complaining about the cost of these fabulous cycleways. The excellent Velib bike hire stations, operating all year. Her view was the investment should have gone into putting lifts into the Metro system .. well, we can agree with that also considering we couldn’t use the Metro with the wheelchair because of the massive amount of steps only. However Stewart thoroughly enjoyed racing around Paris on the smoothest paths ever encountered .. the planning for wheels of bikes meant that there are absolutely no edges or bumps, it’s smooth at all crossings and as long as the cycle path is going where you want it’s a dream experience! The point was .. I have a bike I just wanted to know how the Velib worked. It costs next to nothing (and is free for the first 30 minutes) after you pay the deposit of €150. What a good system for friends and family who come to stay. 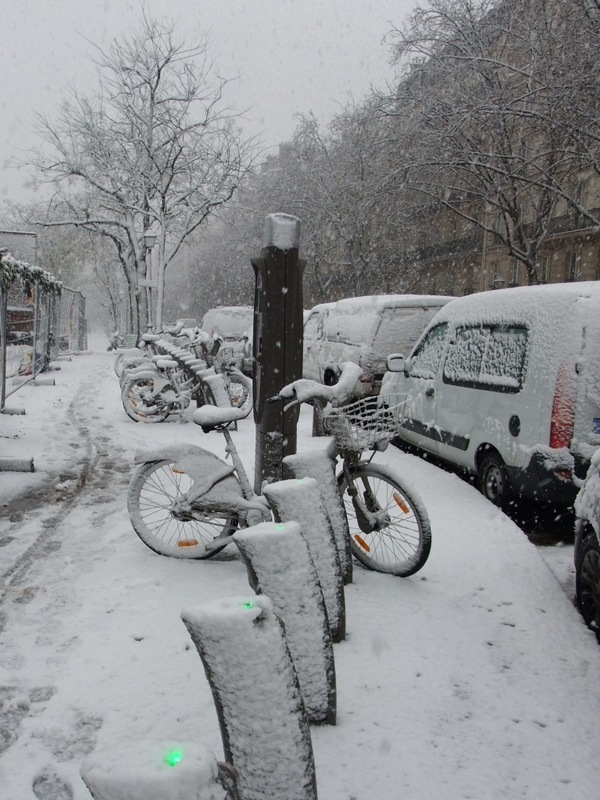 There are more than 2,000 bikes, most are beautifully maintained, and the stations where you can pick one up and drop another off are roughly every 300 meters in Paris. We ignored the Tourist Office and found at another terminal our credit card worked and that it was an excellent service as experienced by our nephew Jack and reported in our blog for March. Paris has to have the best window shopping in the world! What is amazing it doesn’t matter whether the vendor is selling doggie clothes, electrical fittings, metal detectors, home-made biscuits .. anything.. there is always a fabulous display. 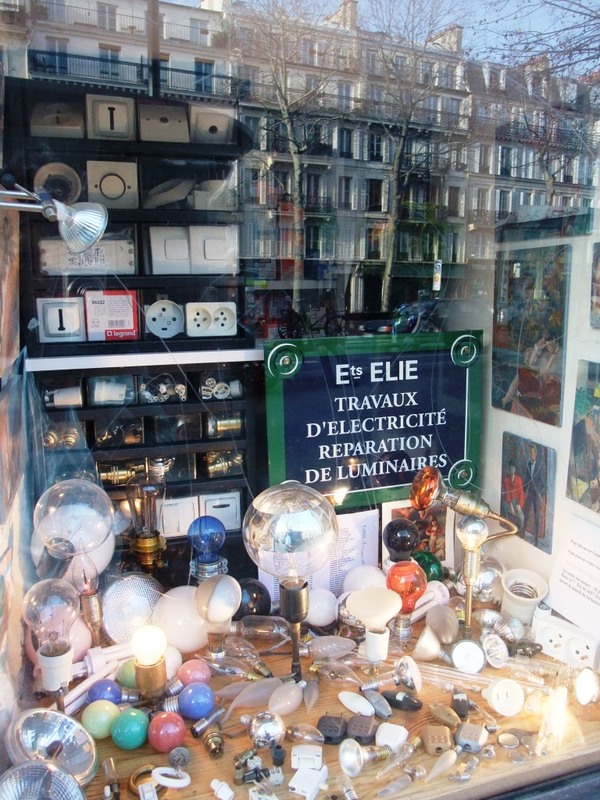 Window shopping: proud of their range of electrical bulbs. Often we see quite quirky displays which make us stop and laugh .. often they are just amazingly creative. 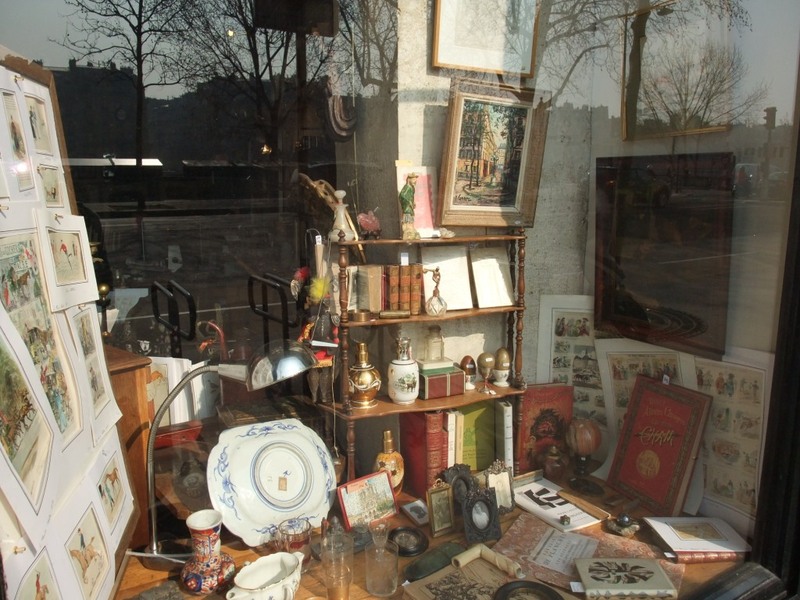 Window shopping: inviting you in .. antiques and charming Parisian souvenirs. And what’s even more fascinating is that we can enjoy looking at the display in the window and as we look into the shop you actually see the person sitting (or standing) working. 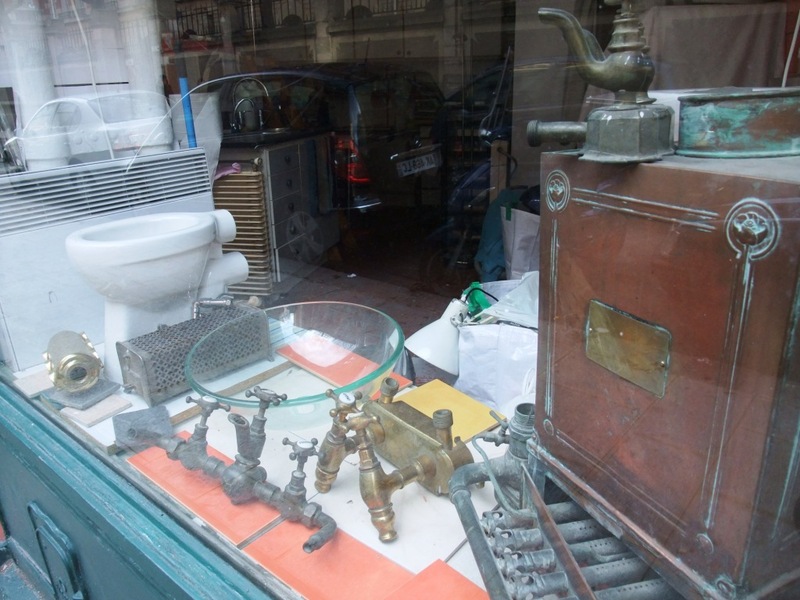 Window shopping: creative display for plumbing enthusiasts. 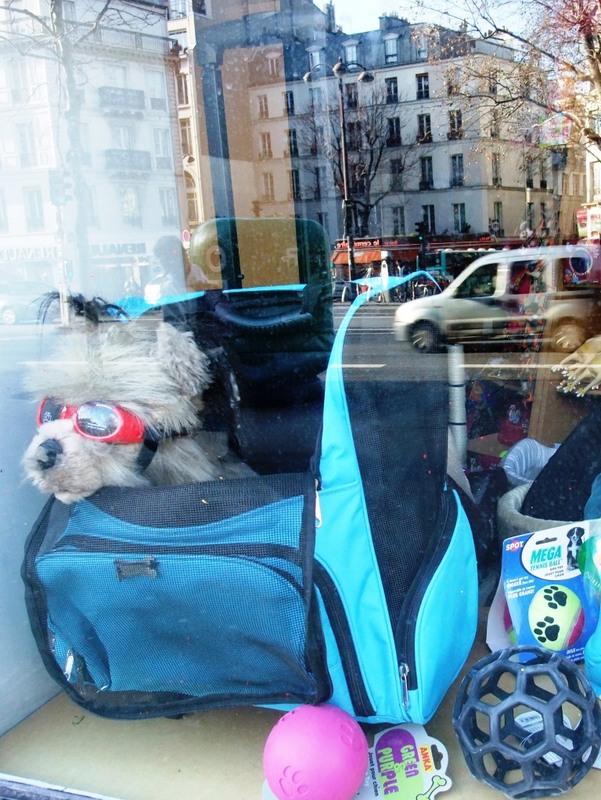 Window shopping: sun glasses, a roller bag of some luxury, everything for your dog. The word we often see above the window is ‘atelier’ which means workshop .. so we see the plumber sitting soldering a pipe, a violin being restored, a chair re-upholstered, porcelain painting, picture frame gilding… it goes on and on, and is fabulous to see. PS: Cheese .. and lots of other delights like marketplaces, cafes, restaurants, bistros. We can’t write about these for health reasons! We will definitely have to make a second instalment when next in Paris. This entry was posted in Accessibility, Waterway life, Waterway services and tagged Endellion barge, Facts and figures, Paris. Bookmark the permalink. It’s been a while since I last checked in and the down jacket is no doubt in the bottom drawer now as you wend your way through the spring. Denise and I are coming to France in September and are devouring your blog. Love the 10 curiosities. Your’s is the best research site I’ve found for Paris and I’m looking forward to reading more of, and sampling your food and restaurant recommendations. I’ve found only one room on a barge near the Eiffel Tower and am wondering if you know of any more accommodation afloat in Paris. Hi Peter .. I know Stewart will reply in more detail. Many thanks for you kind words about the website, it’s so good to know it can be of some value. We will make enquiries about potential barge accommodation. Many thanks Stewart and Lesley for what has been a smorgasbord of vicarious delights and insights. May there be many more. Lovely to hear from you Tim.. we still have so much to do in Paris but we are loving our travels at present. Currently on the Canal Bourgogne heading for Dijon by Easter Sunday.